Since the outbreak of the so-called “Jasmine Revolution” five years ago, leading to the ouster of former president Ben Ali, Tunisia’s key economic and social problems have not been tackled in a way that lives up to the people’s expectations. Quite the opposite, the economy is growing much more slowly than hoped, and a majority of Tunisians believe that corruption has worsened in the past few years.. While the government is struggling to stimulate the economy and collect the necessary funds to invest in the rural Tunisia, various studies advance alarming figures of illicit financial flows. The acerbic effects capital flight has on the economic development of Tunisia merits officials’ attention. When protesters took to the streets calling for the departure of Ben Ali in 2011, their motto was employment, freedom, and dignity. Aspirations for democracy were not the only driver of the civil resistance movement. Unemployment, the perception of corruption at higher levels of the state, and social and regional inequality ignited the anger as much as the lack of liberties. Though the political transition has felt promising to us since the revolution, economic growth has been slow and lags behind pre-revolution levels, inducing further dissatisfaction, disappointment, and frustration against the eight governments formed over the last five years. The evolution of the Transparency International Corruption Perceptions Index in recent years validates the popular sentiment of widespread corruption in the country. These concerns about corruption and the economy are well founded. The most recent report from Global Financial Integrity estimated that illicit financial outflows from Tunisia reached nearly US$2 billion in 2013, translating to US$181 per capita. In research published in 2012 by the University of Massachusetts-Amherst’s Political Economy Research Institute (PERI), the total illicit capital flight from Tunisia is estimated at US$38.9 billion over the period of 1960-2010, $33.9 billion of which was lost during the Ben Ali regime. These outflows, which stem from far more than just corruption, represent a significant loss to the Tunisian economy. Trade misinvoicing represents the majority of illicit financial flows in Tunisia. GFI defines trade misinvoicing as deliberately misreporting the value of a transaction to the customs authority. Such criminal activity takes different shapes. Individuals and firms misinvoice trade in both imports and exports depending on the motives. As an illustrative hypothetical example, A Tunisian company importing electric circuits from France, worth $1 million, might declare a merchandise value of $1.5 million to the Tunisian Customs Agency. While paying $1 million to the French exporter, the Tunisian importer illegally moves $500 million to an offshore account in France. Further, A Tunisian exporter of olive oil could understate the quantity of the commodity or invoice the merchandise under a different reference of olive oil worth less value. The firm would be able to illegally shift the money to the import destination – the United States as an example. The American importer would transfer the declared amount to the Tunisian account and wire the difference to an undisclosed account in the US. 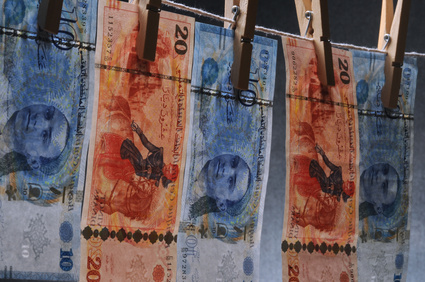 Various factors influence the rationale behind illicit financial flows in Tunisia. One of the motives may be the avoidance of the strict capital controls: capital mobility is very limited and Tunisian citizens residing in Tunisia are bound to repatriate all assets and proceedings abroad. Investors and businesses aiming to shortcut the capital restrictions could over-invoice import transactions or under-invoice export transactions in order to surreptitiously transfer the money to another country. Another incentive for illicit financial flows is tax evasion. Businesses under-report import invoices, thereby paying lower import duties and VAT. Similarly, earning further tax incentives offered for some products by Tunisian legislation may drive the over-reporting of exports transactions. Finally, some illicit financial flows may be motivated by a desire to launder proceeds of corruption or finance terrorism. Blending proceeds from legal and illegal activities, Tunisian companies are able to use the same trade misinvoicing techniques mentioned above to transfer the money abroad and disguise the funds sources. Illicit outflows are a heavy loss, undermining government revenues that could have been invested in growth-driven reforms and social investment projects, helping the country avoid the burden of massive debt. The PERI report, which assumed that the illicit outflows earned a rate of return equal to the US Treasury bill, estimated that the total compounded losses in North Africa exceeded the region’s total external liabilities and the cumulative official development aid during the period 1970-2010. Restraining illicit financial flows and institutionalizing a transparent trade system could save the country unnecessary debt and augment its budget with additional development funds. The democratically elected Tunisian government has the legitimacy to leverage the ongoing process of political transition and reform to implement policies to cease the hemorrhage. Investing in academic research detailing the extent of and economic reasons behind capital flight in Tunisia should be a priority. Determining the impact of tariff prices on tax evasion is one step in the right direction. The government should also engage in significant reforms to bolster the customs authority with regards to trade-based money laundering. Modern technology can help tackle the problem. For example, access to real-time data on the value of most goods could be used for a risk analysis of misinvoicing for import and export invoices. . Without an exhaustive database such as this available to the agents, criminals can easily manipulate invoices to serve their illicit purposes. In his first public appearance, the newly nominated prime minister, Youssef Chahed, declared that fighting corruption is among his priorities. The new government’s success depends heavily on its ability to effectively advance strategic plans to fight nepotism and corruption. These new officials need to give urgent attention to illicit financial flows if they aim to achieve a sustainable economic growth model.